In this era, the modern technology is progressing rapidly, and there is a fierce competition to develop better and advanced technology. New gadgets and utilities are made every day, and they’re becoming more efficient, more reliable and more advanced day by day. As the technology is getting advanced, a fast and reliable internet has become a vital necessity of life. Researchers are looking for ways and means to provide faster network connection as the economy of the country majorly depends upon a better internet connection. 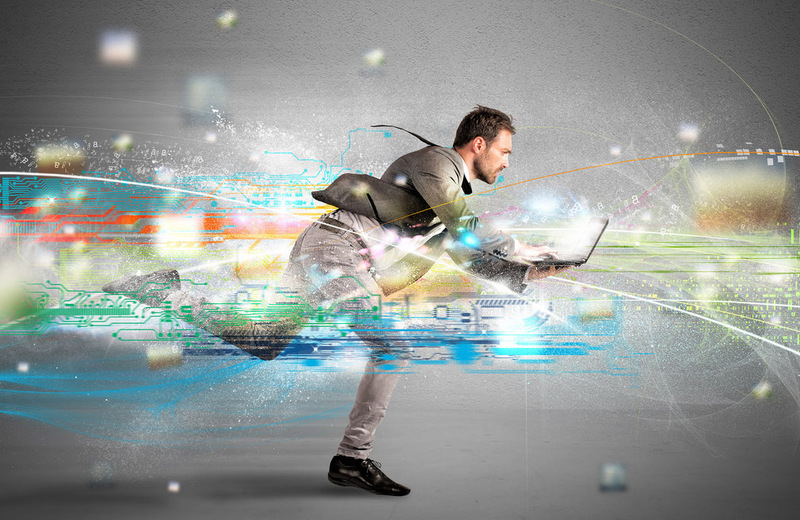 According to the report of Akamai, the average global internet speed was found out to be 7.2 megabits per second in the first quarter of 2017, and European countries are found out to have the fastest internet connections. 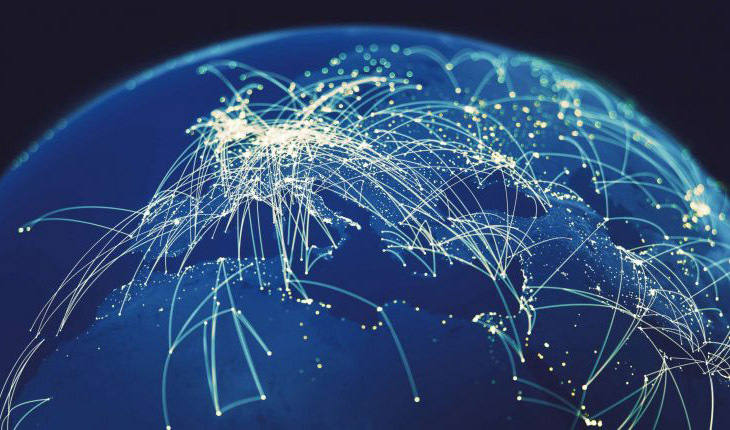 The report was produced by Akamai, and they used an efficient strategy to measure the bandwidths of internet connection all across the globe. They efficiently deployed about 25,000 unique IPV4 addresses in different regions in all the countries across the world and requested data from them from their concerning sites to measure peak and average internet speeds in those regions. The traffic from mobile networks was measured separately, but still, there were some providers that provided fixed and mobile broadband service, and for those, it was difficult to describe both uniquely. Adding to that the internet from cloud hosting services was also neglected as these cloud hosting services have dedicated servers with high-speed internet and that considering those connections would provide an inaccurate speed of connection that an end user experiences. South Korea was found out to have the fastest internet, and it was the only country to exceed the bandwidth of 25 megabits per second with an average speed of 28.6 Mbps. About 40 percent of the total population has internet connection about 40 Mbps. South Korea now ranks second on the UN ICT development index, but it has been ranked the first in the past years. Adding to that, the government has devised many policies and has introduced many programs for the rapid expansion and the use of broadband. Back in 2005, South Korea was the only country that to shift from dial-up to broadband and the country also has the cheapest internet in the world. 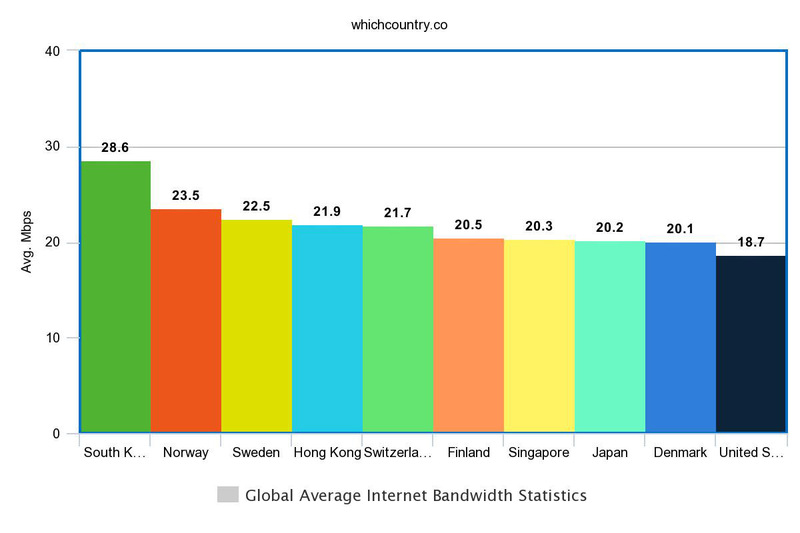 Norway is the country with the second fastest in the world with an average bandwidth of 23.5 Mbps. 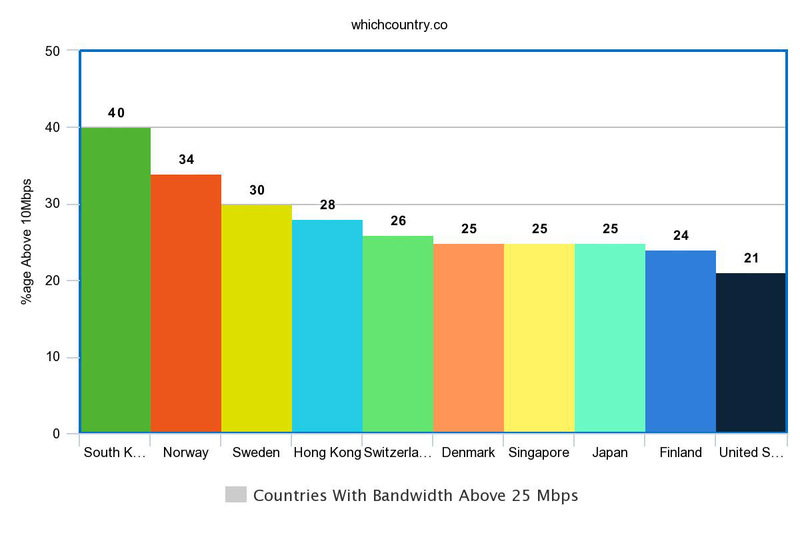 If we look at the worldwide stats, there are only 25 countries that have an average bandwidth above 15Mbps and Norway is one of them. In Norway, more than 69% of the population uses internet connection above 10 Mbps, and the country has also been ranked at 17th place of the fastest peak internet speed with a peak bandwidth of 85.9 Mbps. If we specifically look at the European region, Norway stands in the first place with the fastest average internet speed. If we look into the countries with the fastest peak internet speed, Singapore ranks first with a rate of 184.5 megabits per second. Being a country with lightning fast internet on the planet, there are many plans for improving the internet and pushing the boundaries while at the same times, the companies are striving to normalize the price to provide basic internet at lower rates for attracting more subscribers. The government also pays to heed towards initiating plans to innovate and improve the internet in the country. 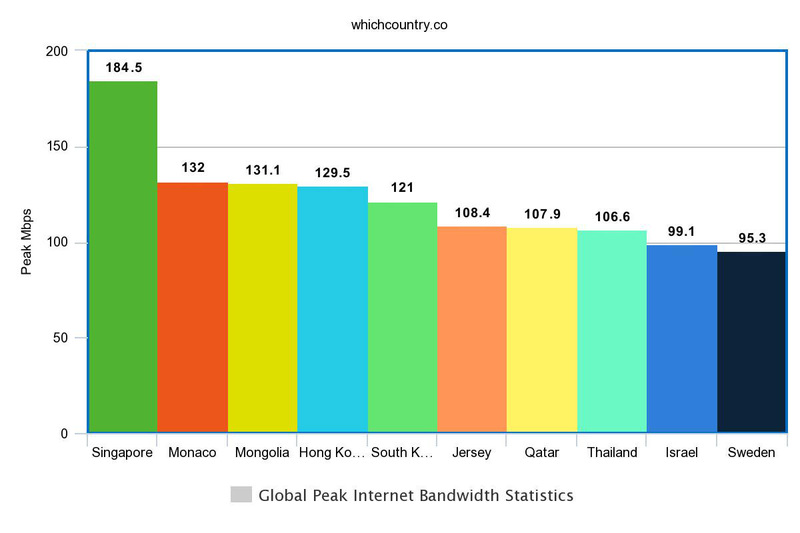 Monaco is ranked second on the list with a peak internet bandwidth of 132.0 Mbps. The country has on of the most developed internet infrastructure, and they use international submarine communication cable for the purpose. The internet bandwidth trends are getting bigger and better across the 51 states of the United States and in the first quarter of the year 2017, all the states enjoyed the double yearly growth. Of all the states, Delaware had the most peak internet speed at 111 Mbps, and District of Columbia was ranked second with the bandwidth of 110.5 Mbps while Mississippi has the lowest peak bandwidth at 58.1 Megabits per second. Speaking of average internet bandwidth, District of Columbia ranked first with the average speed of 28.1 Mbps and the second was Delaware at 15.2. Although there has been a 0.4% decrease in the average connection speed still Norway takes the second spot worldwide, and the first spot in the European region is having an average internet bandwidth of 23.5 Mbps. 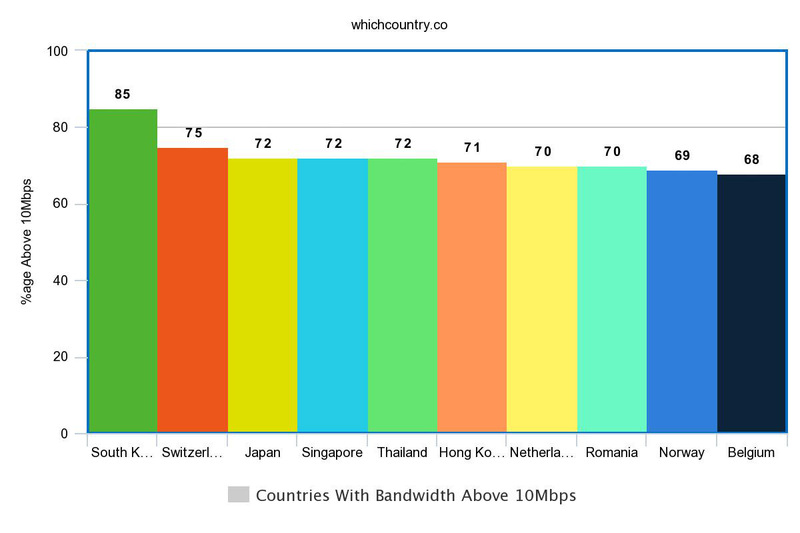 The peak bandwidth in Europe is of Sweden at 95.3 Mbps. Cyprus has the lowest average internet speed in the region at 6.9 Mbps and a relatively low peak speed of 35.4 Mbps.